Humans of Indonesia, a portrait of the country and its people. This is exactly what motivated us to start Humans of Indonesia, a unique photography project we proposed to the Ministry of Tourism in Indonesia when we were invited to visit this land a couple of months back by Indonesia Tourism. Apart from running around 6 different destinations (being this one our absolute highlight!) as part of a large press trip we were part of, we’d be taking extra care to portrait Indonesia and explore the country beyond its main landmarks as well. Focusing on the culture and people of Indonesia. And so we started taking portraits of Indonesian people that came across and was ok with us doing so. Lucky us, Indonesia resulted to be one of those warm countries where smiley people do want you in their lives and in many cases, after asking and shooting someone, we’d find ourselves being the subject as the locals would ask us back to do the same. In the end, we managed to publish almost a hundred pictures on the website we built for this Humans of Indonesia project, and those were of course broadcasted through the Humans of Indonesia specific Social Media networks, being the Humans of Indonesia Instagram once again the leading one, managing to get over 500 followers organically in a few weeks. Satisfied with this pilot black and white photography Indonesia people project, we can say this is only the beginning as we’ll be taking our series on our upcoming trips. Therefore, if you are into portraits, black and white photography, short and visual storytelling or simply enjoy people, keep a close eye on this space. We’ve warned you! 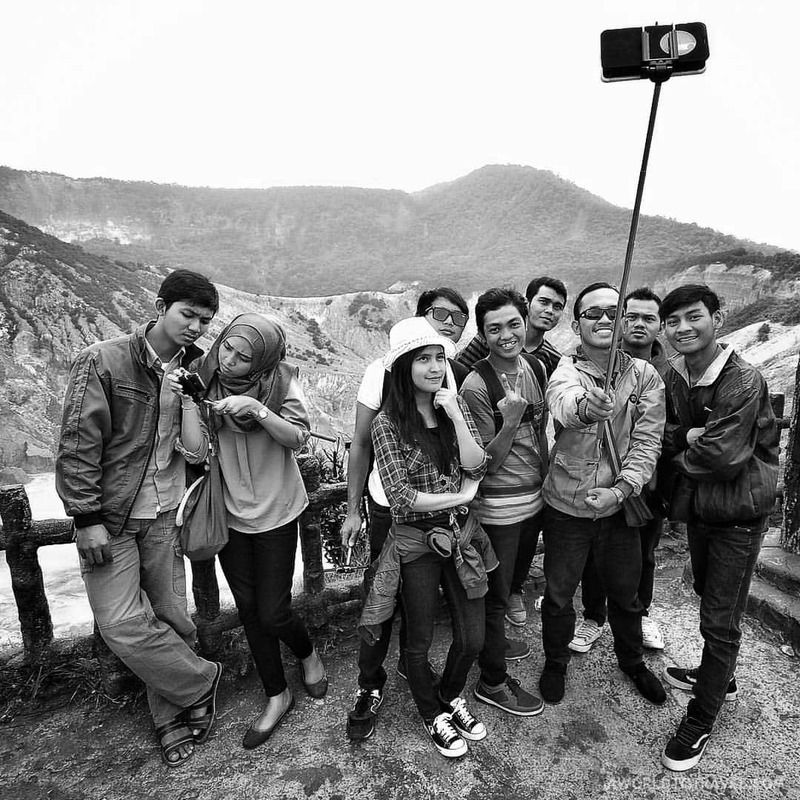 Our first caption, a group of Indonesian youngsters in Tangkuban Perahu, Java. Our captain while discovering Komodo islands by boat. In Labuan Bajo, Flores, Indonesia. I couldn’t have a conversation with these fellas but in this case they were clearly happy to have someone trying to capture the joyous atmosphere. In Dusun Bambu, Java. A sharply dressed self-confident and serene man. He kindly let me take a picture before continuing with his duties. Amanjiwo Restaurant, Java. Tari Topeng Ireng, also known as Dakayan dance is a traditional art performance originally from Magelang city. The founding of Yogyakarta’s sultanate dates from October 7th, 1756. Today we arrived right in time for the aniversary’s celebrations, which included a night parade. Thanks for reminding us not to forget the small pleasures of life. Here’s to walking! In Dusun Bambu, Java. Chess match in a Yogyakarta’s alley. Impressed with the speed of the game. Yogyakarta. This time, let’s Saptono’s art work do all the talking. Ansor’s Silver, Yogyakarta. This lady we found at Borobudur temple at sunrise was chaperoning some little ones that couldn’t stop running around. Wandering around #Yogyakarta’s streets with #INAtopBucketList @aworldtotravel @juanjerez @myadventuresacrosstheworld yesterday resulted in tons of great shots of the active local community. To give you an idea, we spent almost half an hour on these rails as people, carts and bikes were crossing them non stop. Love this city light! In Yogyakarta. 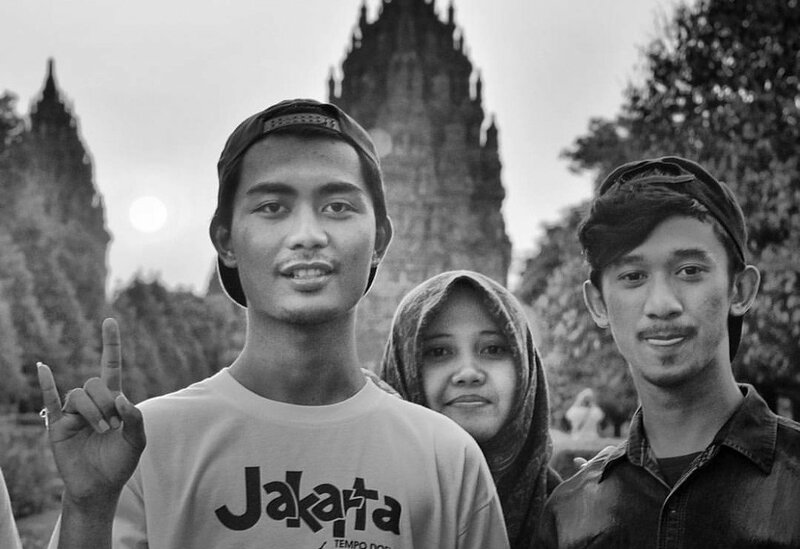 Met so many cool guys at Prambanan temple this afternoon. Take these youngsters for instance. Dunno who was more into picturing the others. Them or us. Still impressed with Yogyakarta’s lively streets. This Yogyakarta local’s breakfast ‘order’? Coffee and a smoke. Yesterday we woke up at 6am to explore our neighborhood. It was interesting to realize that, even when it was a bit too early for us, Yogyakarta streets were full of life already. Kids having a great time next to Yogyakarta’s Water Palace grounds. Taman Sari also known as Taman Sari Water Castle is a site of a former royal garden of theSultanate of Yogyakarta. Built in mid 18th century, the Taman Sari had multiple functions, such as a resting area, a workshop, a meditation area, a defense area, and a hiding place. As the sun is still up there as we type, and we are clearly not used to this humid heat that is melting our brains, we are unable to properly describe this man. Anyway, as they say, a picture worths a hundred words. So here we leave this. In Yogyakarta. Taman Sari, part of the Water Palace where everybody feel like a model. We were there at midday, and although it was boiling hot, nobody could resist the vanity temptation. Noticed that sometimes when we are photographing someone in Indonesia, the surrounding people start making fun of them. 07:00 AM. Yogyakarta. Pictured this lady going uphill with a basket full of groceries. Bromo local. A mask is a must when your work place is full of volcanic dust and sulphure. Trust us. She really knew how to sing and dance. Thanks for such a Labuan Bajo welcome! Street vendor at Sunrise View Point, Mount Bromo. We went up there this morning to enjoy the sunrise, and even when we couldn’t see the Mount Bromo because it was foggy, the overall experience was great. On our way down we saw this girl cooking corn. She had a big smile for everyone. Waiting for Bromo mountain to come out this morning. This man was painting his boat under a great light in a Labuan Bajo beach this morning. Meet Benjamin, a Komodo National Park Ranger who leads the tourists around the Rinca island, full of Komodo dragons with the solely help of his stick. Meet Rhino, one of Komodo National Park rangers that guided us around Rinca Island. Dealing with Komodo dragons on a daily basis is not a small task. Definitely a place and people everyone should get to experience at least once. As we trekked all the way up Pulau Padar, we found this Indonesia human proudly waving the country’s flag. Time tales. After attending a Caci Traditional Performance at Melo village yesterday, we met her. She and her community invited us to their home and everyone was very welcoming and friendly with us. In Labuan Bajo, Flores. Chasing shrimps in Labuan Bajo, Flores, Indonesia. Yet another Melo Village local, where we witnessed the Ceci traditional dance. In Labuan Bajo, Flores. Balinese dancers in Mercure Kuta Beach Bali. Say hi to Gemala @g_hanafiah, a professional surfer, traveler and author. Find her on @wettraveler as well. In Tabanan, Bali. Meet @nilatanzil, founder of @pelangibook, proud mother of @siennalittleexplorer and yet another great Indonesia human . Sanur beach local enjoying the 1st sunbeams yesterday in Bali, Indonesia. Coco milk and coffee expert. As seen at Rumah Desa, Tabanan. Passed this burial procession on our way back to Kuta a few days back. Mind the highway! In Kuta, Bali. Spotted her in Bebek Tepi Sawah Ubud Bali. Caci teaditional dancers at Melo Village, Labuan Bajo, Flores. When they like the story. A few days ago we spent the afternoon sharing stories, dancing, singing, and playing with kids like the one in the picture at Sdk Melo. This catholic elementary school’s library is powered by Taman Bacaan Pelangi @pelangibook . Go check them out! Hard-working Indonesia human under an intense heat in the fields of Rumah Desa, Tabanan. Seeing a group of 30 people with tons of big cameras that can’t stop shooting the Caci traditional dance in your village is something that might or might not happen often. Anyway she was paying attention to what was going on from her home. In Melo Village, Flores. Locals watching the sunset over the rice paddies in Tegallalang, Bali. Canang Sari is a daily offering made by Balinese Hindus in temples, houses or the ground. She was the one making them at our latest stop, Gajah Biru Bungalows in Ubud. Love stepping into happy people like this man at Jogja’s Sultan Palace. Say hi to Hanny Kusumawati @beradadisin. In Bali island, Indonesia. In an island with no rush, no traffic, no cars or motorbikes… this is the closest you can get to witness a race. In Gili Trawangan Island, Lombok. Meet Ang Brown @angdkambuya93 , born in Sumbawa. He manages the Marley bar, a colorful place with reggae tunes in the North East coast of Gili Trawangan. Gili Air welcome by these three yesterday as our boat from Bali stopped in every island part of this archipelago before reaching our destination, Gili Trawangan. Cheers from here! Meet Windy @windy_ariestanty , another beautiful indonesian human in Yogyakarta. Ramayana ballet show with Prambanan temple as background. One of the dancers at the Ramayana Ballet Show Prambanan, Indonesia. The show has the majestic Prambanan temple as background. At Ramayana ballet Open Air Theatre Prambanan. Harvesting rice. In Tabanan, Bali island, Indonesia. Here’s Nico Wijaya @nicwij, a videographer we had the pleasure to meet during this trip. Bike rides in Gili Trawangan. Woman in Malioboro, one of the most busy streets of Yogyakarta, aka Jogja. Gili Trawangan main road, connecting the West and East parts of the island. It is not as busy as it could seem. One of the everyday heroes that make Gili Trawangan work, carrying construction supplies along the island’s unpaved roads with the solely help of his horse. In Gili Trawangan, as everywhere else, you can see lots of engineers for not so many workers. A stoner and a f*cker in his own words, @dansupit is the PR and marketing communications person of the @windowbar , one of your best bets to witness sunset in Gili Trawangan West coast. If you are wondering, yes, we spend a fair amount of time in this island’s bars 🙂 Cheers from paradise! A kid runs away from the intense heat, looking for a shadow in Ratu Boku, an archaeological site in Jogjakarta. Looks like it is not just us, Komodo locals are also stunned to these islands beauty. Pink Beach Komodo island. Riding through the rice paddies in Tegalalang Rice Terrace Ubud, Bali island, Indonesia. A Rinca island ranger, armed with a wood stick to keep Komodo dragons away from the tourists. Dream job anyone? These kids were having a blast while standing on the safety mobile fence in front of Yogyakarta’s main railway junction. Spotted him in Labuan Bajo, Flores, Indonesia. She’s the welcoming face of Saung Angklung Udjo in Java. There you can experience the harmony of nature and culture trough a perfomance of dance and music with traditional instruments made of bamboo. Kawah Putih (White Crater), a colorful lake in a volcanic crater near Bandung, West Java. The lake is 2400m above the sea, and the acidic waters make posible the unbelievable turquoise colors which together with the surrounding mountains make it a perfect spot to be visited and, why not, with all the family. Wanna know more about our Indonesian adventures? Head here. Brilliant shots guys, especially the beautiful juxtaposition of tradition and modernity that characterizes so much of Indonesia. Very nice! Great project and you guys clearly have a lot of talent behind the camera and obviously in terms of human spirit too in order to be able to have such great access to take such personal shots. So many great ones, but one photo in particular really captured my attention (called Time Tales with a woman with a towel around her head) – I’d love to see it a little larger as I think you’ve captured someone incredible there. Definitely gonna follow this and can’t wait to see more! Such a lovely idea and it must have been a really fun, exciting project to work on. I was in Indonesia earlier this year! Well done! Oh definitely! I was only in Lombok and then Bali and the Gili Islands but I really want to explore more of Indonesia. This post only strengthens that! This is very very awesome!!! Thanks so much Fickry! Big hug!! Awesome expose of the people of Indonesia! I really enjoyed looking at each and every one. Thanks so much Nancy! Glad you enjoyed it. Great photos. I am going in December so I am excited to experience the people and culture first hand! Thanks so much! Hope you have a great time as we did! Really beautiful portraits – are you guys going to put this together as a whole big project like HoNY et al Also what places did you visit on your press trip, that sounds like so much fun! And thanks so much for stopping by and commenting. Indeed, HoNY has inspired us in the past and will continue to do so in the future. However, this is a bit of a different approach. Anyway, YES! We’ll keep doing this series in upcoming travels and we are also thinking of reviewing past trips portraits to do something similar as well! Regarding to our route, please have a look to this article where we put together our itinerary 🙂 Hope you like it as well! Wow your pictures are absolutely beautiful. I love taking portraits of people on my travels. Thanks for stopping by and commenting Anita! Oh, my, God! This project is absolutely amazing! I am flabbergasted by the shots, the ambiance, your assiduity. Keep going, you are all beautiful! Things like this really make our day. Have a great one you too!! Amazing photos and a wonderful idea for a project! It’s important to go off the beaten track and talk to people like you did – for me this is what constitutes the true spirit of every country. We couldn’t agree more! Thanks Monika and safe travels! Ahh, I love these photos. So much character, soul and of course so many stories! You have a real gift for capturing the essence of a person. These pictures are unbelievable! To this day the people of Indonesia are the kindest, happiest and most peaceful people I’ve ever come across. You’ve captured this beautifully. Just blown away by these stunning pictures! I’m a landscape photographer personally, and like to kid myself it’s because I love capturing the scenery, but in reality it’s because I don’t have the confidence to work with people taking photos of them. It’s so much harder (and possibly therefore more rewarding!) to photograph people, so brilliant job! Thanks so much! We really appreciate your kind words. But let us tell you it is not as difficult nor invasive as it seems. People usually loves to be taken pics of! Or at least the people we’ve came across of. So go for it! This is a brilliant project, it really helps you to see more of the country! Lovely project and more so because it is in B/W. Contrary to popular perception, B/W pics seem so much more vivid especially for portraits or photos with human subjects. We hear you Rishabh and Nirali! In the beginning we balanced pros and cons, BW won! 😀 Happy it turned out pretty ok.
We thought so as well, Jade! Unas fotos fantásticas! Sabéis leer a las personas y vuestra fotografía lo transmite. Grandes! Hi Alexis! It was a pretty cool one, yes 😀 Thanks for stopping by and commenting! AND SAFE TRAVELS! Indonesian people are so sweet, the pictures couldn’t look bad with those huge smiles! Every time I go there I feel like at home. Congratulations!